While most of our guitars are custom-built to order, we will occasionally build an instrument for inventory and place them for sale. Quarter-sawn heart pine core body - reclaimed from a granary in Northern California. Super light weight. Reclaimed Maple neck with upgraded reclaimed birdseye maple fingerboard - all of this maple came from the Harriet & Henderson Yarn Mill that is currently being deconstructed in Henderson, NC. 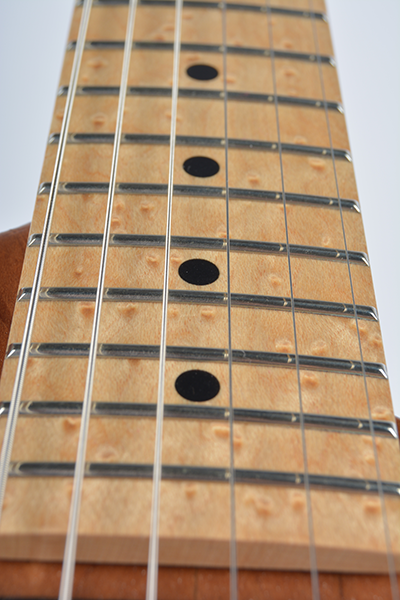 22 fret, 12" radius, Graphtech nut. 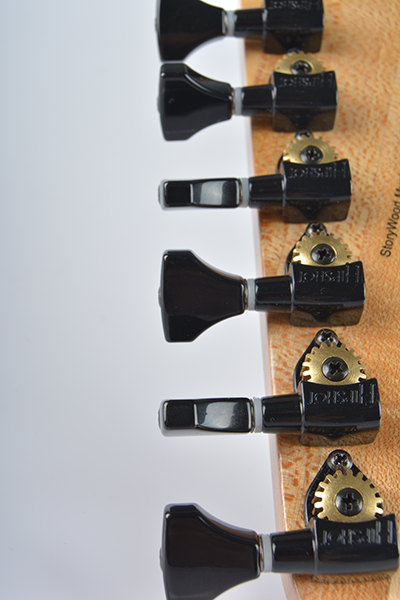 HSH pickup configuration from Artisan Guitar Electronics with 5-way selector. Warm, vintage output that still pushes an amp nicely. So many tones here! Wiring - this guitar is wired with Volume/Tone Cut/Bass Cut controls, a push-pull to split the coils on the humbuckers in to single coils, and a push-pull to add the neck pickup at any time (allows for 7 distinct tones). Comes with Gator gig bag. Hardshell case available for additional cost. While we have played it a bit while taking photos, and it is in perfect shape, we'd like this in someone's hands to enjoy and have discounted the price. It has a very San Dimas vibe going on and so much tonal flexibility. Interested? Contact us today at sales@storywoodmusic.com, or give us a ring at 919-946-4700.